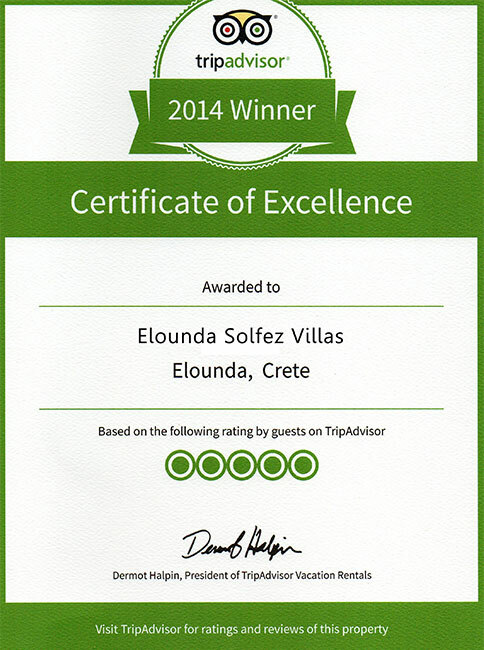 Elounda Solfez Villas are self catering accommodation in Elounda, Crete, Greece. They were built late in 2009, in a traditional style and combine bright earthly colors with natural stone (the local stone of Elounda, collected during the building excavations), handcrafted by local and foreign craftsmen. They are equipped to a high standard with all contemporary amenities, offering a comfortable setting for our Guests. The exterior areas are formed with respect to nature and the environment and include swimming pool, barbecue and a sun terrace with a pergola on the pool level, plus a smaller pergola on the middle level balcony. Each villa (approx.94 m2) is ideal for 2 to 6 people, arranged on three floors. The main entrance on the first floor leads to a comfortable living room with a fireplace while adjoined there is a tastefully furnished dining area with a fully equipped kitchen. Both rooms share a large balcony that offers an unobstructed view of Mirabello Bay amidst the Cretan landscape.